Set high on the shoulder of one of the most iconic peaks in the Pacific Northwest, Timberline Lodge and Ski Area continues - after 80 years - to offer one of the most exciting and unique high-alpine mountain experiences in North America. Staying at Timberline's luxury condominiums—The Lodge At Government Camp—makes for a fun and unique "mountain town" experience for your next family ski vacation. 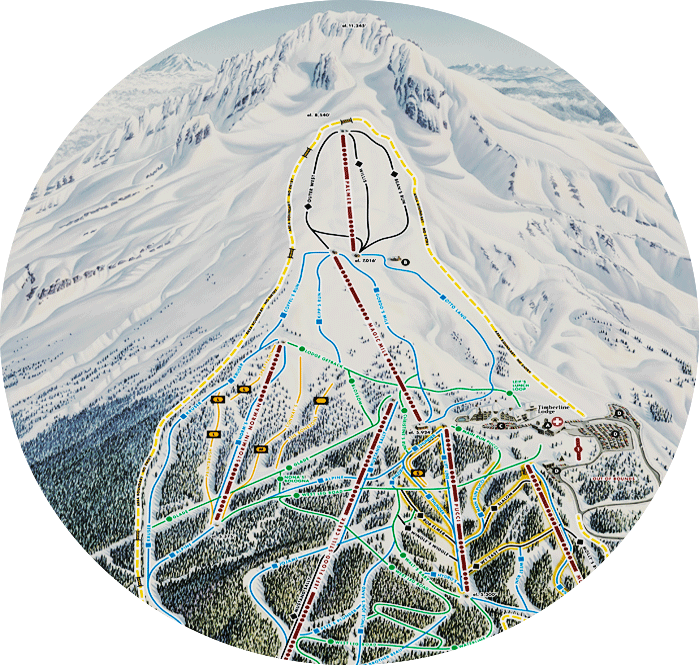 Timberline Lodge and Ski Area is always hiring for a variety of positions: food & beverage, lift ops, hotel, and more. Timberline offers a very competitive employee benefits package. Silcox Hut at Timberline is the ultimate bed & breakfast at 7,000'. Open all year for overnight stays for groups of 12 to 24 people. Now offering discounted rates for midweek stays this summer! From innovative and ever-changing regional cuisine in the Cascade Dining Room to the best darn cheeseburger you've ever had at a resort, dining is an activity not to be missed at Timberline. Next to the towering stone hearth or on the mountain with sweeping views of the Cascade Range, Timberline has eleven venues for weddings of all sizes. Corporate retreats, weddings, or family reunions, we can accommodate and assist any size group for any kind of gathering, and the historic lodge makes for an unforgettable venue any time of year. With the land and historic lodge owned by the U.S. Forest Service, Timberline Lodge and Ski Area has been family-operated since May 1955. Just like many of our staff, we grew up skiing on Mt. Hood and generations of our families continue to come back to this special place: an experience we’re committed to sharing with our guests.